In small bowl, mix lime juice, oil, garlic, cumin and salt. In large resealable food-storage plastic bag, place chicken and 1/4 cup of the lime juice mixture. Seal bag; shake to coat chicken evenly. Refrigerate 30 minutes to marinate. Set remaining lime juice mixture aside until serving time. Heat gas or charcoal grill. Remove chicken from marinade; discard marinade. On 8 (12-inch) skewers, alternately thread chicken, onion and bell pepper. Place skewers on grill over medium heat. Cover grill; cook 10 to 11 minutes, turning occasionally, until chicken is no longer pink in center and vegetables are done as desired. Place kabobs on large plate; drizzle with reserved lime juice mixture and turn to coat evenly. 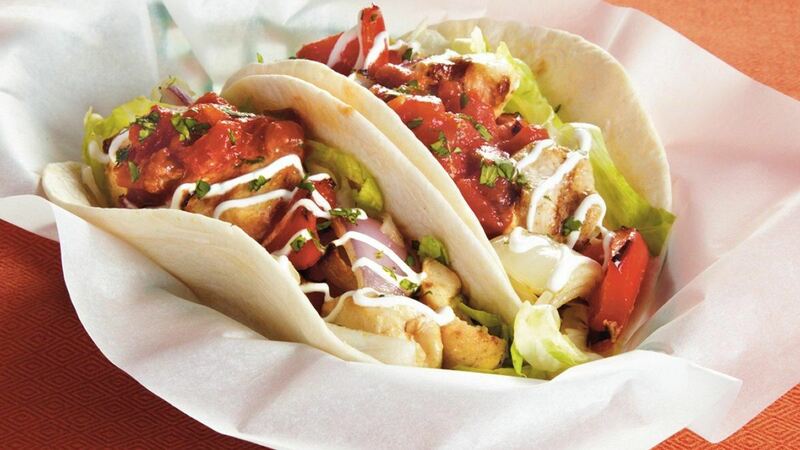 Slide chicken and vegetables off each skewer onto 1 tortilla; serve with salsa.